Lewisburg - As the home of Bucknell University, Lewisburg is the consummate college town. 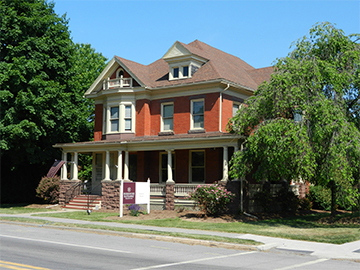 Its historic downtown is walking distance to the campus and was honored by the National Register of Historic Places. Offering a rich arts scene and vibrant community atmosphere, Lewisburg contains a mix of old and new housing offering something for everyone at all price points. Mifflinburg - Nestled along Rt.45 just to the west of Lewisburg, the Mifflinburg experience is that of unspoiled 19th century charm. Loaded with specialty shops and historic charm, you’ll find concerts in the park, blueberry and bluegrass festivals, and so much more in this rich and wonderful community. Milton - Located along the Susquehanna River just south of I-80, Milton is ideally situated for the person who wants to live in a quiet community of 6,700 people and be able to jump on the highway to get to work in just a matter of minutes. Its primarily older home stock is well maintained and affordably priced. Having one of the largest industrial parks in north central Pennsylvania, Milton is home to many who live only 5 minutes from work! Sunbury - With a population of over 10,000, Sunbury has something to offer everyone. Its location at the meeting of the West and North Branches of the Susquehanna River means there’s plenty to do for those who love water sports. It’s also a community loaded with history, only a short hop to regional shopping and overflowing with a sense of community. Selinsgrove - Quaint shops, restaurants and businesses with an abundance of colonial and early American architecture set this town apart. As the home of Susquehanna University, it’s got the vibrancy of a college town combined with the relaxed ease of small town living.